Sometimes the best trips aren’t jam-packed with thrilling activities or hectic days but rather time to admire the beauty of nature and appreciate scenery that doesn’t ask for attention. Every year, striking landscapes in the Northeast flaunt the rich pigments of changing leaves and will remind your travel group of the sheer magic of September and October. Pack your group into a van and get comfortable because the captivating views along Route 125 – also known as the Middlebury Gap Road ­– are endless. 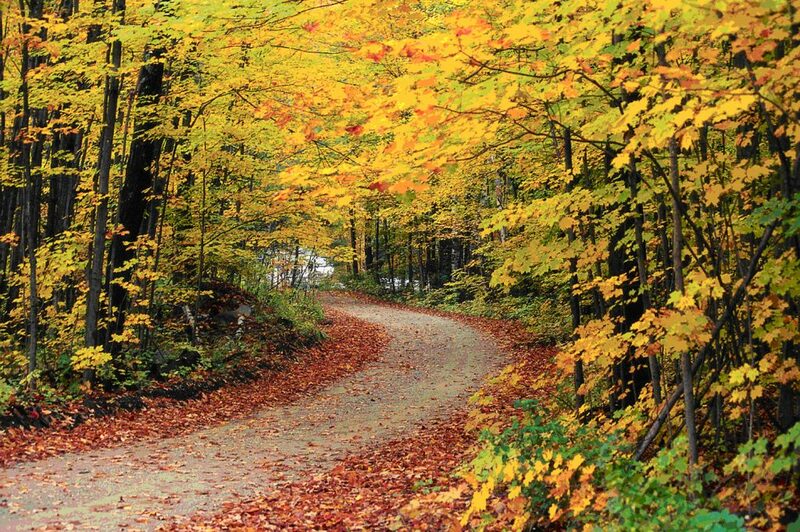 The highway will climb and dip through Green Mountain National Forest like ocean waves, as you pass sugar maple trees flushed with a burnt orange hue. Take a pit stop for a picnic at Texas Falls, the 70-foot waterfall often referred to as the Jewel of the Green Mountains. Then continue down Route 125 towards Ripton, the picturesque hometown of poet Robert Frost. The Kancamagus Highway, also known as “The Kanc,” runs through White Mountain National Forest in New Hampshire and is known for its spectacular displays of blushing maple, birch and beech trees, mostly untouched by human development. Drive slowly down the winding lane, but don’t forget to pull over to enjoy hidden waterfalls such as Sabbaday Falls and Lower Falls. At 2,855 feet, the Kanc is crowned by the Kancamagus Pass, a scenic spot that overlooks the rugged White Mountains and offers a stunning panorama of vivid autumn shades. 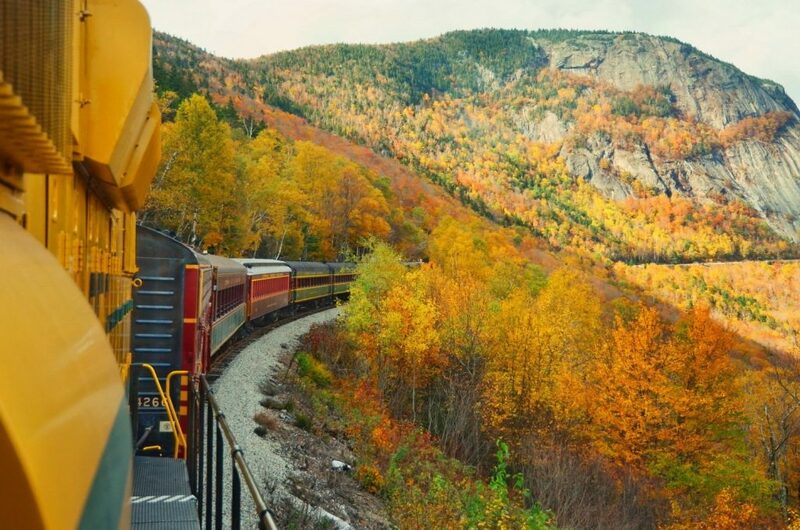 For groups who prefer railroads to highways, the Conway Scenic Railroad excursion allows travelers to experience the majesty of Crawford Notch through the window of a vintage train car. Your group will feel completely immersed in the brilliant New Hampshire foliage rather than simply admiring it from afar. Enjoy a three-course lunch as the train makes its way across the Frankenstein Trestle, a late 19th-century bridge that provides sweeping views of steep ravines, the awe-inspiring White Mountains and effervescent Saco Lake. Savor the bold colors of autumnal Maine while meandering along the Rangeley Lakes Scenic Byway, a historic highway that wraps around the gorgeous Rangeley Lake and scales the Appalachian Mountains, all painted on a canvas of scarlet, purple and yellow. Pull off at the lookout on Route 17 and then hike to the peak of Spruce Mountain to reach the Height of Land, a spectacular vista that overlooks Mooselookmeguntic Lake and 500 acres of protected forest. This spot is regarded as the most impressive view of northern New England (especially at sunset), so allow your group to stay a while and take it all in. Lake Champlain is a top destination for fall foliage tours in Vermont due to the kaleidoscopic swirls of color that emerge when the flaxen eastern cottonwood trees reflect off the translucent water. Give your group the chance to see the lake and surrounding vegetation from a bird’s-eye view while aboard a hot air balloon. Balloon rides offered at Above Reality provide expansive views of Lake Champlain and the Green and Adirondack mountains. Plumes of rust orange pepper the Housatonic River shoreline, a river that is surrounded by thick forestry and sloping mountains. Your group will have a blast wandering the many forest preserves in the area such as Housatonic Meadows State Park and Kent Falls State Park. During your visit, be sure to stop for a picture of the Cornwall Bridge, a scarlet bridge that contrasts well against the golden leaves. Kent, a town sitting amidst the Litchfield Hills, is another essential pit stop for those traveling to the Housatonic River. 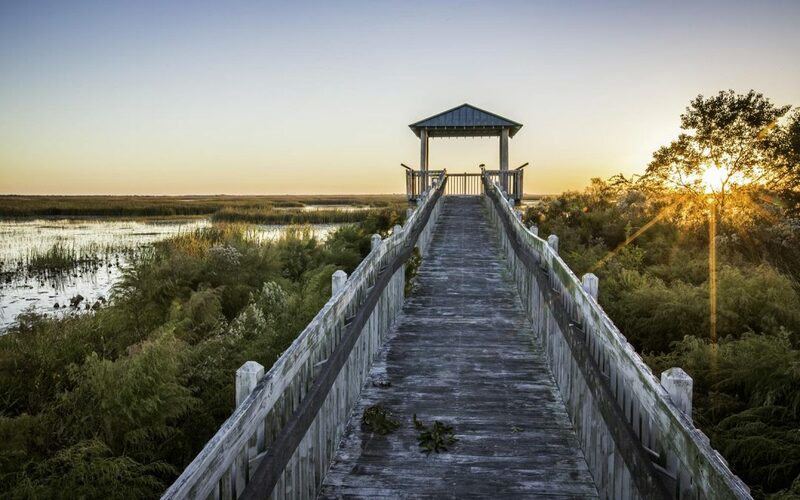 Stop by this charming spot for wooded trails, a bite to eat or overnight in a homey bed and breakfast. Best-known as writer Henry David Thoreau’s muse, Walden Pond is also recognized for its large expanse of fall colors that seem to stain the surface of the water as if it were a mirror. 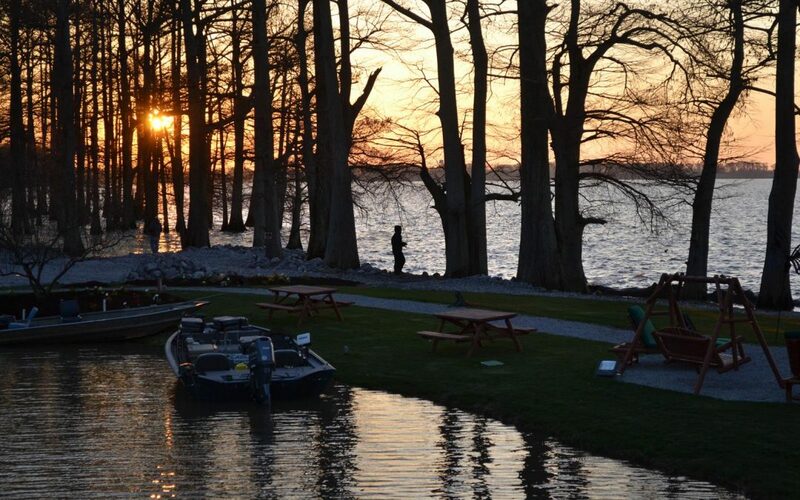 Your group will revel in taking a peaceful walk around the pond and enjoying what many consider to be living poetry. After spending time in the Walden State Pond Reservation, it will become clear why Thoreau chose to spend so much of his life here and why he considered it to be the source of his respect for nature. Venture to Macedonia Brook State Park in Kent, thought of by some as the best town in New England for fall foliage views. The autumn scenery is best seen at the summit of Cobble Mountain, a 1,365-foot mountain known for a broad range of trails that vary from difficult to relaxing. Although the climb through narrow trails and steep bluffs can be strenuous, the payoff at its peak is well worth it. The sweeping landscape offers views through the Harlem Valley and over the state border to the Catskill and Taconic mountains. On your ascent, be sure to follow the trail that is blazed white and stop to rest at 51 Site campground for a picnic. 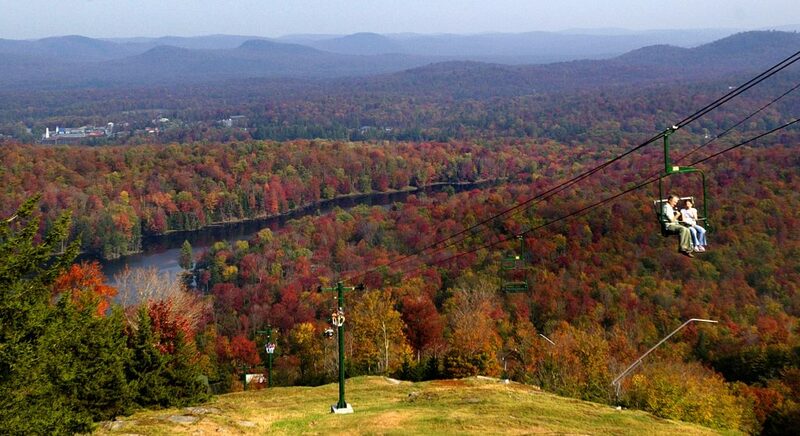 For travelers looking for a high-energy way to appreciate the ravishing foliage of the Northeast, Hunter Mountain in New York has got you covered. The renowned sky ride presents up to six passengers with a birds-eye view of the northern Catskill Mountains. For adventurous groups who would rather not be held back by a guard rail, the Hunter Mountain zipline is the longest and highest in North America and allows travelers to soar over fall canopies at up to 50 miles per hour. Visitors who would rather not dangle at 600 feet can enjoy Hunter Mountain’s Oktoberfest, a free event which features crafts, food and live music. Cannon Mountain in New Hampshire is not only recognized for its prepossessing scenery at the 4,080-foot peak but also its picturesque trails along the way. Follow the Lonesome Lake Trail until your group hits Kinsman Ridge Trail, which will take you directly to the mountain’s observation tower at the summit. For those who would prefer to spend more time admiring the foliage rather than trekking through it, the aerial tramway at Cannon Mountain provides a stunning panorama of the buttery amber, fiery crimson and yellowing emerald of Franconia Notch Park all from the comfort of a cable car. PreviousMel Tye: Tye’s Top Tour & Travel Inc.